How many times have you said... I am not going to spend any more money on repairing my Validator? It's no secret that the Pelton & Crane Validator experienced many repairs. To avoid Additional repair bills, you can now completely rebuild the Validator sterilizer by removing all of the electronics, and replacing them with mechanical components. The sterilizer will still vent & shut off automatically, but without circuit boards or computer electronics. Many of the original Pelton & Crane OCM or OCR users who purchased the Validator tell us they wish they could go back to their old OCM or OCR sterilizer. Why? Because those sterilizers did not have electronics in them, and they worked for years. The mechanical components that we put in the Validator are similar to the components which are in the Pelton & Crane OCM or OCR models (which proved themselves to be very durable, dependable, and virtually indestructible). The Pelton & Crane Validator was the original electronic sterilizer on the market.The concept was great... push a button, and the sterilizer will fill itself with water, come up to temperature, stay at 273f degrees for the proper amount of time, vent itself, dry, and shut off. All in one push of a button. There were three(3) generations of Validators which were produced by Pelton & Crane. The 1st generation was the Validator which had a brown cover and beige front. The 2nd generation was the Validator with a cream color both on the cover and on the front. The 3rd generation was the Validator Plus (same colors as the second generation). You can continue to spend more money in repairing your Validator. There is no end to it. Based on the history of this sterilizer - this is not a sensible option. You can go out and buy a new sterilizer. This is a valid option. The question is, would you get another electronic sterilizer or a manual one? Your answer probably would be a manual one. But...all manual sterilizers do not vent automatically. This is a very big draw back. Instruments will stay wet. It's OK if you use the instruments right away. However, if you bag the instruments, and put the bags on the shelf for future use, they must be 100% dry when removed from the chamber. There is an option on a manual sterilizer to vent the sterilizer manually when the bell goes off. What doctors and end users tell us is that in most cases, nobody can hear the timer when it goes off, and the sterilizer goes into a slow vent and the water stays in the chamber. Keep your Validator, have us convert it to manual so it will shut off & vent automatically! You may continue to use the same tray or cassette system you are using. The sterilizer will continue to occupy the same space in your clinic you and your staff won't have to learn how to use another type of sterilizer. And, by the way, it is less expensive than buying another "equal-in-size" manual sterilizer! 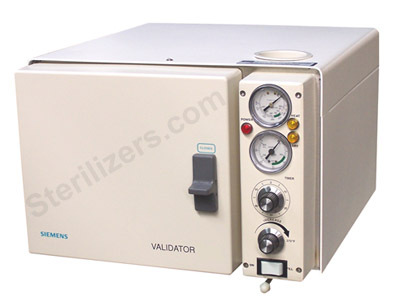 When I get back my refurbished Validator sterilizer, will it look any different? Except for the front panel, it will look exactly the same (see picture below). The Validators have an excellent chamber and a superior heater both with excellent durability. So, the components which will be kept are...the chamber, heater, door, door cover, door mechanism, bottom, back panel, and outside cover. All other components will be new. It even looks like new. Call now 1-800-801-9934. We will pick up your Validator and refurbish it for you. If the sterilizer does not perform to your expectations, we will take it back within 90 days of purchase date, and refund you back your money 100%. The risk is totally on us. Your investment is $1795.00 (plus freight) to refurbish your Pelton & Crane Validator Sterilizer. We have refurbished several hundred Validators, with excellent results! This refurbished sterilizer will now get the job done, and perform time after time. You can now have a sterilizer you can count on to work without fail! 1. Cohen Herbert DDS we refurbished his Validator in 1995. 2. Werchola Olga DDS we refurbished her Validator in 1995.